Children with disabilities are often mainstreamed into regular classrooms these days. Cece Bell, the children’s book author, was one of them. In her delightful graphic memoir, El Deafo, she shows us the difficulties — but also the benefits, especially if you can turn your disability into a superpower. El Deafo is for kids 8-12, but I loved it. And I also learned a lot from it. This review first appeared in The New York Times on Sunday August 23, 2014. In this appealing graphic memoir by the children’s book author and illustrator Cece Bell, young Cece is only 4 when she comes down with meningitis. She survives, but her hearing doesn’t. At first, like any newly and suddenly deafened person, she retreats into herself, scared and confused (“I stay close to Mama, no matter where she is”). When she starts first grade in a mainstream school, she is given a “Phonic Ear.” She can hear, very well, but it’s the mid-1970s and the technology is clunky: The Phonic Ear is a big box Cece wears strapped to her chest, wires running from it up to her ears. Cece wears the receiver, and her teacher, Mrs. Lufton, wears a microphone and transmitter. Bell’s full-page illustration of Cece wearing the Phonic Ear describes the elements of the device and also conveys Cece’s wry, spunky sensibility. “Underside of Phonic Ear: Freeeezing cold in winter, hot and sweaty in summer; therefore, undershirt a must!” Toward the bottom of this self-portrait, an arrow points to: “Underpants! 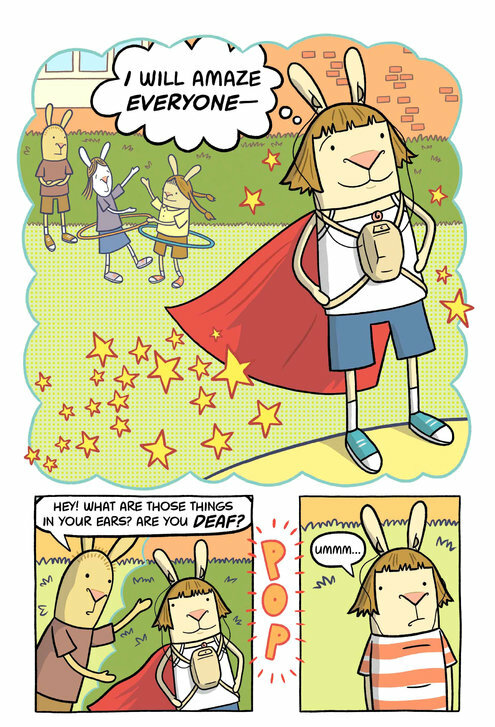 avert your eyes!” Cece and all the otherwise human-­seeming characters in “El Deafo” have rabbit ears (and rabbity noses), a witty visual metaphor for the outsize role ears play in the life of someone with hearing loss. Cece’s life is full of the drama and trials of any schoolchild, but deafness complicates them, and she sometimes feels she exists in a bubble of loneliness. At a sleepover, when the girls turn out the lights, she loses the visual cues she needs to understand what her friends are talking about, and she calls her mother to take her home. In an author’s note, Bell acknowledges that some deaf people embrace their deafness while others want to “fix” hearing loss. “They might think of their deafness as a difference, and they might, either secretly or openly, think of it as a disability, too.” That’s fair, and honest. It takes a bit of an inner superhero to get along as someone “special” in a classroom full of “normal” kids. Bell’s book should be an inspiration for those who are “different,” and it should help others to understand just what being different means. Required reading isn’t always fun reading. “El Deafo” should be the first and is definitely the second.